Marriage Labels for Wine Bottles. Getting Wed? 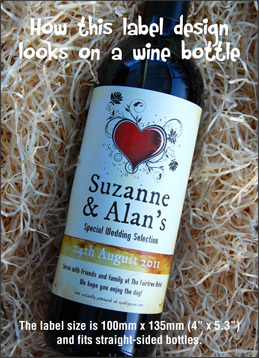 Have the wines for the wedding day specially personalised. 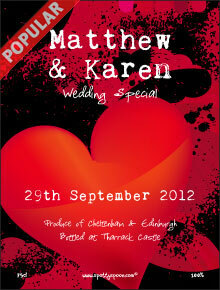 This wedding label design is our most popular for marriages. 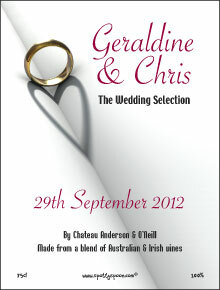 Easy to word, it is a simple way to personalise the table wines for the reception and ceremony. Add the Bride and Groom's names, the date of the wedding and any special message to change a plain wine bottle into something extra special for the big day. Note - good words that convey this important day and also describe the wine are - a unique blend, long-awaited, From the (Groom Surname) & (Bride Surname) Vineyards, will mature perfectly, Best served with (reception meal eg. venison & pesto mash) etc. 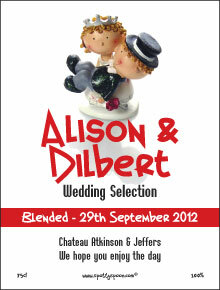 We are so pleased with our wine labels and can't wait to see our guests faces on the day !! Really good service. The labels are fantastic. They are for my daughters wedding in July and we are really pleased with them. 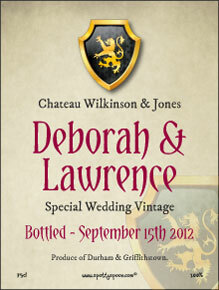 So much so I have just ordered a one off label to put on a bottle for my friends 50th Birthday. I would definitely recommend your site to others. arrived the next day, amazing! Superb service Sind very happy with product. Fast, easy service with a great product. Great service and was able to respond very quickly to changes.